This is identical to the recent Vancouver - Vietnam - Philippines deal, except you are flying to Malaysia instead of Vietnam. You fly from Vancouver to Kuala Lumpur, Malaysia and then fly from Manila, Philippines to Vancouver. The flight between Kuala Lumpur and Manila is not included. 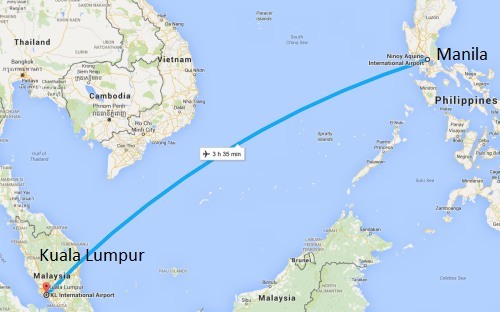 It typically costs around $100 CAD (or less) to fly non-stop from Malaysia to the Philippines. Air Asia often has the cheapest flights. Click on the departure date box to try other dates. Focus on Mon/Tue/Wed/Thu dates in the months listed above to see what's available. 2. Click through from Google Flights to the United website. You may also be able to find these for slightly cheaper by searching on Momondo.ca - And if you can't seem to book them from Google Flights (some dates work, some don't), it's also worth trying from Momondo. You can also find flights where you fly from Vancouver and spend time in Japan, Malaysia, and the Philippines (and then fly back home to Vancouver) for $629 CAD including taxes. 2. Click through to the United website. If you play around with the dates on Google Flights you're likely to find similar prices with shorter or longer stays at each destination, to suit your needs. You'll notice you still need the flight from Malaysia to the Philippines mentioned at the top of this blog post. vancouver, yvr, flight deals, southeast asia, ana, united airlines, all nippon airways, kuala lumpur, kul, malaysia, manila, philippines and mnl.